MISSION, KS--(Marketwire - Sep 13, 2012) - (Family Features) When it comes to choosing new furniture, it's easy to get stumped when purchasing key pieces. Homeowners have to consider how each piece will blend with existing décor. While the word recliner may evoke images of your father's favorite plaid-covered chair, recliners today are designed with comfort and style in mind. 1. Choose a size. Keep in mind how much physical space you have allotted for a new recliner. Consider not only the space available in your living room, but also the size of recliner that will fit your shape as well. "Recliners with attached ottomans will never fit your exact shape and size," says Janet Odum, national sales trainer at Ekornes. "Choose a chair with a feature that allows you to unlock the ottoman, so it tilts when you recline, which takes pressure off your knees, ensuring a more comfortable position." The better a chair fits you, the more comfortable you will be in it. 2. Seek comfort; consider longevity. While you may be inclined to purchase a less expensive model, you want to ensure your investment is worth the cost of the recliner down the road. Be sure to consider the quality of fabrics, leathers, woods and metals from which each recliner is composed, as well as the comfort of the piece. Keep in mind that finding the proper fit will mean more comfort. And while quality recliners may cost more up front, the right recliner will provide years of comfort and support. For example, according to Good Housekeeping magazine, the average recliner lasts about 10 years with regular use. Stressless recliners are built to last between 20 and 25 years. 3. Narrow down your style preferences. For many, the idea of choosing a bulky recliner to complement existing décor may seem impossible. But recliners now come in a variety of designs and materials. Whether you're searching for a modern and sleek chair, or a beautiful love seat composed of wood and leather, you can find a recliner to match your décor preferences. 4. Make a list of must-have features. Recliners now offer a variety of features, so keep in mind the features you most desire. For example, are you looking for a recliner that gives you total body support -- including lumbar support -- when you're in the reclining position? New recliners, such as Stressless recliners offer added comfort features such as an articulating headrest, which cradles the head and neck in the reclining position. In addition, these recliners offer a sleep function to fully recline, and a dual support base, ensuring that the base of the recliner will provide even support whether you're sitting, or in the full reclining position. 5. If you're still stumped, go with a classic model. If you have trouble choosing between several styles, consider this -- if you're purchasing a recliner that will last for two decades or more, you may want to keep in mind that your home décor preferences are likely to change in that span of time. Choose a classic piece that will complement any style evolution. 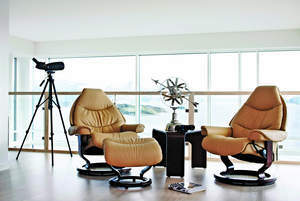 To learn more about the variety of recliners available, and to find a store near you, visit www.ekornes.com/us/stressless-recliners.